DragonPOS works on any windows based PC, no special equipment needed. Use what you probably already own and work from the cloud. DragonPOS is incredibly user friendly and combines all our functionality into one easy to use system. You and your employees will love DragonPOS. Add discounts on an order or customer level. DragonPOS also supports loyalty coupons, sales and specials. Customize receipts with your name address, phone number and email. DragonPOS has fields for owners names, and DCA numbers in applicable states. Use multiple systems in your operation, as many as you like, with no extra license charges! On your counter, back room, office and sorting area. DragonPOS can support multiple pricing structures simultaneously for different account types or cleaning services. Assign your customers once and done. Orders ready ahead of time, have a declined credit card, or need to simply contact the customer, DragonPOS can easily send email notifications to your customers with 2-way communication. DragonPOS can support items, colors and fabrics unique to your store with full wholesale and retail pricing control. Even complex multi-piece orders such as school and military uniforms are a breeze. DragonPOS works beautifully with touch-screen monitors which can easily be connected to your PC for a low cost - quick customer entry method. Open an online store in minutes and quickly start reaching and signing up new customers in real-time. No need to be a web expert. Create a beautiful and effective online presence with our customizable and easy to edit website designs. Let customers sign up, schedule pickups, view orders, make payments and more on their smartphone or table with responsive designs that work great on any device or screen size. Already have your own website, DragonPOS will supply you with links for your customers to sign-up, schedule pickups, view payments and more that will integrate directly with your DragonPOS point of sale system. Reach more people, in more areas, than you ever thought possible using the DragonPOS seamless signup. Offer your customers pickup and delivery service on your days open and time schedules. DragonPOS encourages your new, and existing, customers to select a schedule and keeps them coming back with automated reminders, paperless receipts, and encrypted billing. With DragonPOS customers can click and schedule as needed from their Smartphone, PC or tablet. All scheduling and routing is handled automatically within the DragonPOS system. 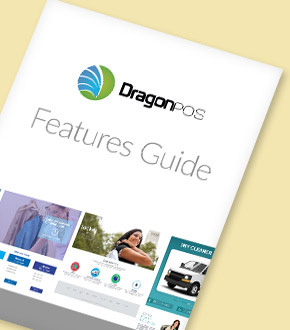 DragonPOS gives today's customers what they need and demand - service and convenience. This includes access to orders, payments, scheduling and preferences plus, 2-way email communication. Never worry about hosting or security again. DragonPOS takes care of everything with a 256-bit SSL certificate and redundant hosting. DragonPOS handles all your customers seamlessly both in-store and online. Customer requests are automatically integrated into the DragonPOS system for routing pickup and delivery. Your customers will be automatically routed according to their requested day and time. DragonPOS will direct your driver from your store or plant to your customers and back in the quickest and most efficient route. Your customers can select from pick up days and times that you set on your DragonPOS system. You can also schedule customers easily, on-the-fly, from within your retail operation. Customer manifests can be printed for your drivers convenience, or can be emailed to their smartphone or tablet for on-the-go real time routing, through and around traffic, for quick and efficient pickups and deliveries. DragonPOS will keep your customers coming back, again and again, through our courteous email reminders, customized with your company name and information, reminding them to have their dry cleaning and laundry ready for pick up. Ditch the paper receipts, DragonPOS will automatically notify your customers to log on to their account when an order has been created in your system. Maximize high volume accounts with DragonPOS. DragonPOS directly integrates with your customers for real time scheduling, order information, payments, communication and marketing. Offer your customers service and convenience on a level never before experienced. All your website and customer pages are smartphone friendly and look beautiful on any device. Your customers can access all functions, from sign up to payments and everything in-between, clearly and easily. Reach more customers than you ever thought possible, and have them sign up in real time, with critical information that flows directly into your DragonPOS system, for total customer control. Having a robust sign up page, combined with reminders, encrypted payment methods and full account access, makes it easy and encouraging for customers to select recurring schedules, which in turn equals recurring revenue. Offer your customers the ability to request pickups when they need you, with the click of a button. Their request will automatically be scheduled and managed by the DragonPOS manifest and routing system. With no paper receipts to slow you down, service single and multiple bag pickups with ease. Customers will automatically receive an item log in notification with detailed order information for their records. DragonPOS will capture and encrypt customers payment methods, allowing you to drop off orders quickly. Customers can easily see payments and the order where it was applied, reducing or eliminating your accounts receivables. Customers, directly through their account, can change personal preferences with ease, such as pickup days and times, payment methods, special requests and more. Communicate to you customers, as needed, right through the DragonPOS system and have them respond to you, all through your existing email account. Reduce or eliminate your accounts receivables. Charge delivery customers with ease, and quickly accept in-store payments directly through your customers accounts with complete payment details. With DragonPOS you can accept credit cards, checks, cash or offer open invoicing with emailable invoices for easy customer reference. Accept payments by any method, in part or in full, in any combination that your customer requests. DragonPOS will track and keep accurate records of every transaction. DragonPOS can accept partial payments for incomplete or pre-pay orders. Every dollar will be accurately tracked to the corresponding order. DragonPOS will encrypt all online and in-store customers. With 256-bit SSL technology your customers information remains safe, and for you, seamless account billing. Love your processor - keep them, DragonPOS will connect your processor to our POS through an electronic gateway, or use our preferred processor for maximum savings and super low rates. DragonPOS works with a wide range of hardware, probably some of which you already own. Well help get you started and connected with DragonPOS to get you up and running and operating fast.